March 20, 2009 marked the six-year anniversary of the invasion of Iraq. Although the half a dozen years of occupation must seem like an extended nightmare from which Iraqis are anxious to awake, for many young Americans an occupied Iraq is the only Iraq they have ever known. This is precisely why Nadje Al-Ali and Nicola Pratt’s research could not have come at a better time. What Kind of Liberation? offers a revolutionary perspective on the war that has come to define a generation, using a gendered analysis that factors in women’s historical participation in Iraqi society, attempting to separate it from the one-dimensional warzone it is known as to many Americans today. In the tradition of colonialism, the U.S. initially engaged in the war under the guise of freedom, campaigning specifically for women’s liberation. 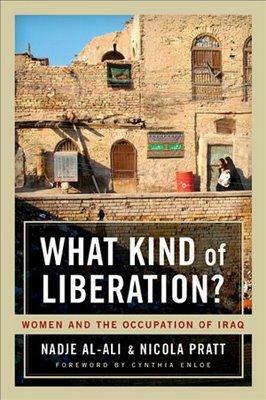 Tragically the manipulation of women’s interests as a strategic element of the occupation transformed women’s bodies into the location of a cultural war between the growing number of Iraqi insurgents, politicians and citizens opposed to the war, and an American administration that pushed women’s liberation as a Western cause. Al-Ali and Pratt largely based their research on women in the Iraqi diaspora who had lived through, or who had family that lived through Saddam Hussein’s rule and the subsequent occupation of Iraq by the U.S. military. Their interviews reveal that despite the violence and tyranny implemented under Hussein, many of the interviewees imagined pre-invasion Iraq as a safer space for women. Although they do not attempt to sympathize with Hussein’s regime, they show that it was not until after the invasion, and after the U.S. spearheaded the campaign of the “liberation” of Iraqi women that women became the site for the rejection of Western values, and a return to conservative values was made on a nation-wide level. What Kind of Liberation? presents us with a messy, complicated and living Iraq, a society with a rich history that is not streamlined. Iraqi women speak about their histories in their own words, offering a snapshot that largely contradicts what we see unfolding in the American media. Despite the U.S.’s promises for the future of Iraqi women, no investment was made in women’s interests when creating the new Iraqi government. Their voices were largely excluded. But these broken promises have not stopped female activists and politicians from braving threats and harassment and the backlash of a war in which they were used as part of a fictitious cause. In the foreword Cynthia Enloe explains why Al-Ali and Pratt’s book is so necessary, “It’s happening. The country, the complex, dynamic society that is Iraq, is becoming ‘Iraq,’ just as the complex, dynamic society that is Vietnam has become merely ‘Vietnam.’” Nadje Al-Ali and Nicola Pratt’s gendered analysis of the war and historical documentation of women’s activism will contribute to the growing pool of knowledge that separates the orientalist notions of “Iraq” from the diverse and complicated country that has room for a future for men and women alike.